Here is a tool that I love and have found many uses for depending on what I need to accomplish. I didn’t start out fully understanding what it was, but over time saw how useful (and a time saver) it was! So what is a Social Jukebox? It is a site where you can load in premade tweets to be sent out at whatever times you choose. These premade tweets don’t just go out once like many programs offer, they continue to go out in a random order over and over again. You will want to load your Jukeboxes with several tweets or it will look pretty boring if you are only sharing the same thing over and over. Plan ahead and get a big list made and sorted into categories before you get started. You can include images in your tweet, but keep in mind that images do take up characters and makes your tweet text shorter. You can add links to your tweet with no problem. Be sure to think of a variety of Jukebox topics, so you can target different things in an organized way. The tweets are sent out in random order, so by having different jukeboxes, you are sure to send a variety of post. You will want to load most of your Jukeboxes with evergreen content or make a special box for limited offers that you can delete after the offer is finished. There is a free version that you can try out, but it only allows you to send 5 tweets a day and limits you to how many accounts and jukeboxes you can have. The lowest paid plan is only $12.99 a month and can really get you rolling. 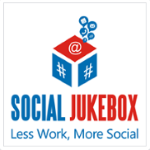 This plan allows you to link up to 3 social accounts, have 10 jukeboxes. The small paid plan is great for most people! I will add that you can add a Facebook account, although I don’t use it for any Facebook post. Facebook is so picky about 3rd party apps posting that I just don’t do it. So there ya have one of the secrets to some of the Twitter mega posters.